Tambun Indah Land Bhd will develop the RM640mil Pearl City Business Park on 107 acres in Simpang Ampat in early 2013, the biggest commercial centre in the northern region. Phase one of the project comprises a tenant-mixed control leisure mall with food and beverage and retail outlets, a karaoke and a cineplex. “Phase one will also feature a RM140mil commercial project with 188 commercial lots, which will start construction in mid-2013, and an international school,” says Tambun Indah managing director K.S. Teh. The Straits International School and the leisure mall are scheduled to start construction respectively in the first and second quarter of 2013. “The Straits International School, which is under a Cambridge curriculum, is scheduled to commence the first intake in January 2014,” says Teh. Phase one is scheduled for completion in 2016. The group is now planning for phase two which will include a hypermarket, medical and wellness centres, gated landed properties, and a furniture village. 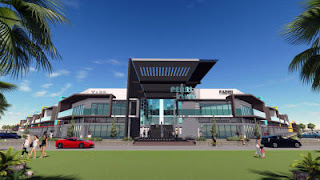 The Pearl City Business Park is located close to the second bridge, North South Expressway, and the double-tracking railway, connecting Padang Besar and Ipoh. There are 12 established and growing industrial parks within a 15km radius of Pearl City Business Centre, providing support for the project. The Prai Industrial Estate, Penang Science Park, Bukit Minyak Industrial Estate, Bukit Tengah Industrial Estate and Batu Kawan Industrial Park are among the well-known industrial estates. “Seberang Prai will attract new home seekers who are looking for quality lifestyle living with pricing within their income range,” Teh adds. The group is currently undertaking six residential projects, comprising 1,197 landed properties, and a commercial scheme, comprising 152 shop offices, with an RM840mil GDV for its Pearl City project on a 150-acre site in Simpang Ampat. The project is scheduled for completion in 2014. The selling price for the Pearl City properties ranged between RM288,000 and RM800,000 and about 65% of the Pearl City properties have been sold to date. Tambun Indah Land Bhd, a property development group with projects largely in Seberang Prai, still prefers the mainland to launch new projects this year, despite rising property prices on the island. Of the five new projects, the group is undertaking in the second half of 2012, only one, the RM236mil Straits Garden, is located in Jalan Jelutong on the island. The new projects Tambun Indah is undertaking in the second half in Seberang Prai include the RM204.38mil Pearl Residence and RM73.5mil Pearl Impian in Simpang Ampat, RM32.5mil Carissa Villas-Residence in Jalan Raja Uda, and RM51mil BM Residence in Bukit Mertajam. These projects have a gross development value (GDV) of RM597.6mil. The Pearl Residence comprises bungalows, double-storey terraced houses, and semi-detached houses, while the Pearl Impian project is made up of double-storey terraced houses. The Carissa Villas-Residence is a three-storey terraced house project, while the BM Residence comprises apartments and landed properties. The projects in Seberang Prai are priced between RM280,000 and RM500,000. The Straits Garden on the island comprises 183 condominiums and 230 commercial suites, priced respectively from RM688,000 and RM318,000 onwards. “The lower land price in Seberang Prai fits in well with our development philosophy of providing quality lifestyle living at affordable prices. “Due to the high land prices on the island, concept options are basically limited to high-rise development, varied only in terms of pricing and unit sizes. “In contrast, lower land prices on various parts of the mainland present an option for more innovative concepts and designs depending on its location and suitability. “This option offers us more opportunities to innovate and provide our home buyers with higher quality living standards which they can afford. “We have completed several landed strata gated and guarded projects as well as high-rise development in Butterworth and other areas of Seberang Perai,” he says. The group still has about 700 acres of land in Simpang Ampat, which will be used for future development of mixed-development projects, Teh says. Tambun Indah has sold 60% of the strategically located Straits Garden project since its launch in August 2012. “This is due to Straits Garden’s proximity to the inner city of George Town, the Penang Bridge, and the Free Industrial Zone, which has enhanced the project’s appeal to home seekers,” Teh says. The group will continue searching for strategic land bank on the island for its future development to deliver homes of quality, Teh adds. Scheduled for completion in 2016, the Straits Garden is the group’s second project on the island after the Scotland Villas Condominium, completed eight years ago in 2004. ”Scotland Villa’s value has appreciated by about 80% since,” he added. Tambun Indah is confident of getting good responses from home seekers due to the affordability and range of its products which are mostly priced between RM280,000 and RM500,000. “Our purchasers also have a choice of owning gated or non-gated units depending on their preference. “Sales statistics indicate that over 50% of the purchasers for the Pearl Villas gated and guarded parcel at Pearl City are from the island. “Completion of the Second Bridge next year will offer them a choice of getting quality lifestyle living on the mainland at an affordable price with the convenience of easy travelling to work on the island in the near future,” he says. On the impact of the global slowdown, Teh says the group expects to see property prices in Penang level off, as prices have escalated too fast on the island. “We are not immune to the effects of the European crisis and the slowdown in the US and China property markets.